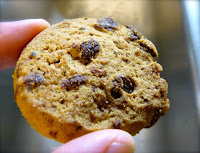 Today was Day #4 of Chocolate and Gluten-Free Cookie Theme Week. 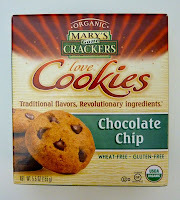 These Organic, Wheat-Free and Gluten-Free Chocolate Chip Cookies from Mary's Gone Crackers (based in Gridley, CA) were crunchy and satisfying. When I opened the inner wrapping (for one of two individually-wrapped bags), I thought I smelled and tasted molasses, and then a faint flavor of sweet coconut. 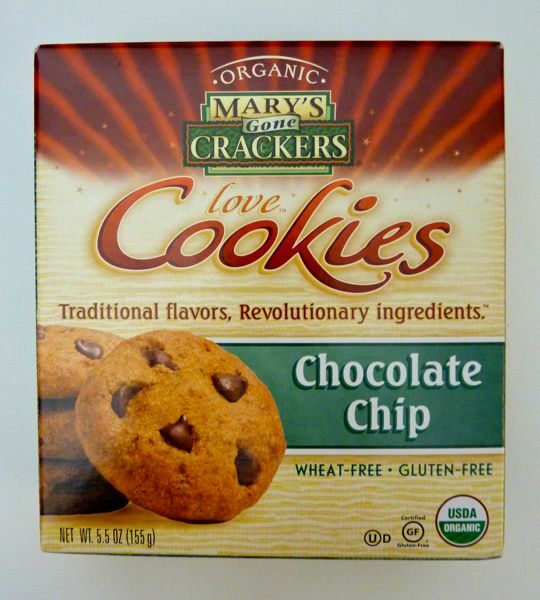 Mary's also offers a line of gluten-free crackers that are made from whole grains and seeds and that have a very hearty taste and texture that I've enjoyed with cheeses. Like the crackers, I felt like I was enjoying cookies that were healthy, without any compromise in taste, and without the pasty mouth-feel that sometimes accompanies gluten-free flour substitute mixes.